Gajner Palace is a vast Grand Heritage property, sprawling over 6000 acres. It was built by H.H. Maharaja Sir Ganga Singhji to be used as hunting lodge. These days, it is a heritage hotel managed by the HRH Group. Gajner Palace is a red sand stone construction. An excellent destination for a holiday that is close to the nature, Gajner Palace is built besides a lake. It has a private wildlife sanctuary that is populated with chinkara, black buck and neelgai among other animals. The lake attracts over a hundred species of migratory birds, including the Imperial Sand Grouse, during the winter season. The corridors are decorated with photographs of the Royalty and from the days of the British Raj. To suit the tastes of the present day traveller, the heritage hotel has restored the original property and all modern conveniences are available. A cosy hotel with 13 suites and 31 rooms, choice of lake facing suites and rooms are available. The entire accommodation has period furniture and the suites also have chandeliers to add to their beauty. The Rajasthan cuisine here has adapted several authentic game recipes savoured by the royalty after their hunting sessions. Also while staying at Gajner Palace, enjoy early morning and late evening walks as well as camel, jeep or horse safari. 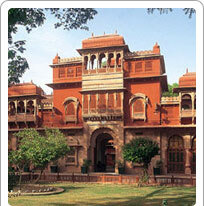 The Gajner Palace can be easily included into your itinerary if travelling to Bikaner or Jodhpur.